With pre-designed Blocks for everything from Galleries to Information, we have you covered. Use the Block Generator to add content to your pages and build faster than you ever dreamed possible. Explore the possibilities today! 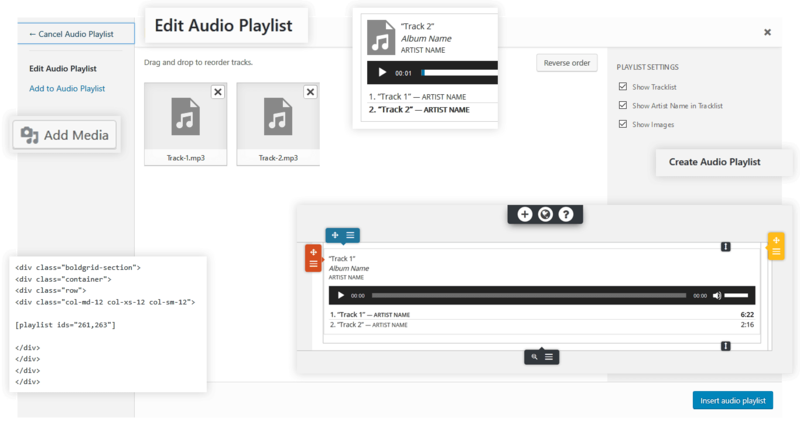 BoldGrid Builder works seamlessly with the Audio functions present in WordPress, allowing you to create audio playlists with a few simple clicks that can display single or multiple tracks. 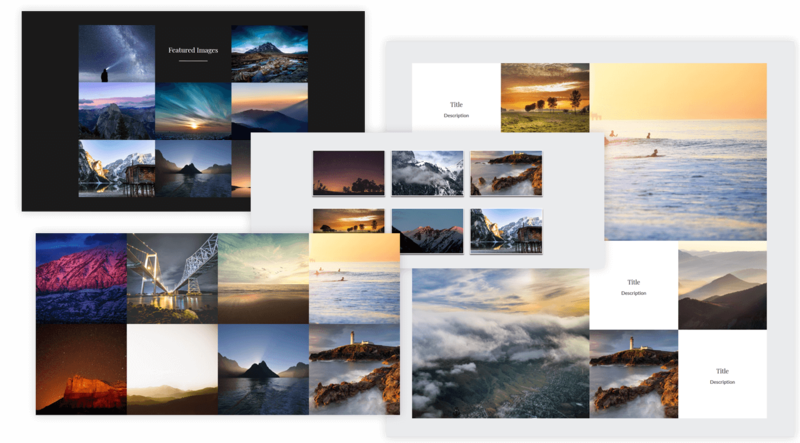 Easily insert a Gallery with tons of pre-designed Blocks and customize them with your own images quickly using the Auto Cropping features built right in. 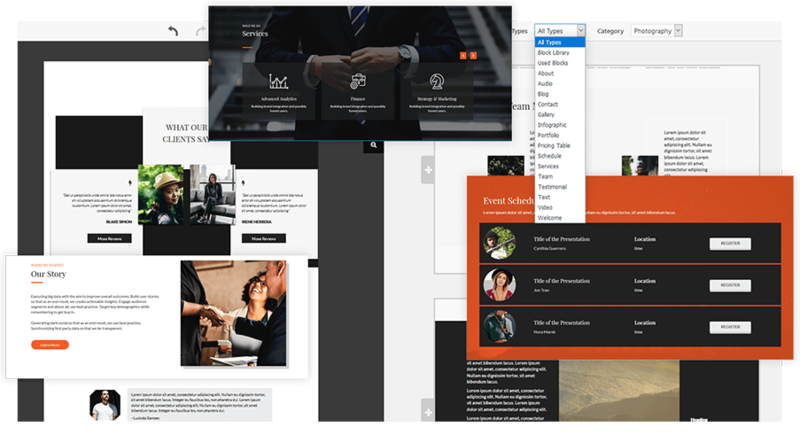 Using the Post and Page Builder, building a robust, beautiful Gallery from scratch only takes a few minutes with our unique drag and drop WYSIWYG tools. 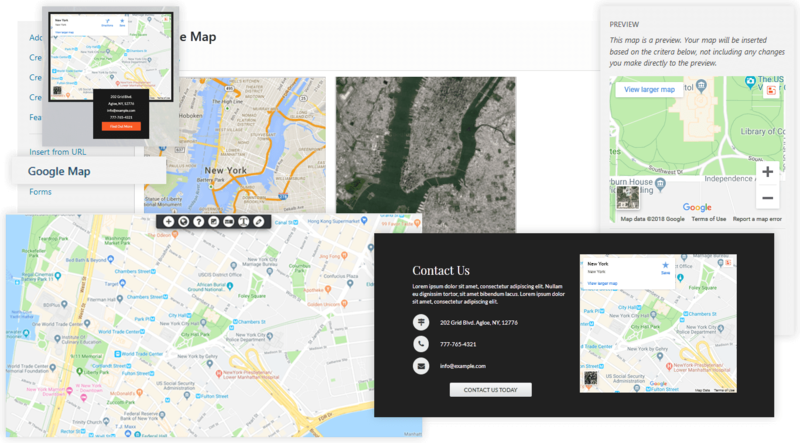 With our Google Maps Integration, adding a Map has never been easier. Simply use the Add Media Button, add your location and insert into your page. Using Map Blocks is also a much quicker way to get the look you want! Using the Post and Page Builder, customizing your Pricing tables is easy. 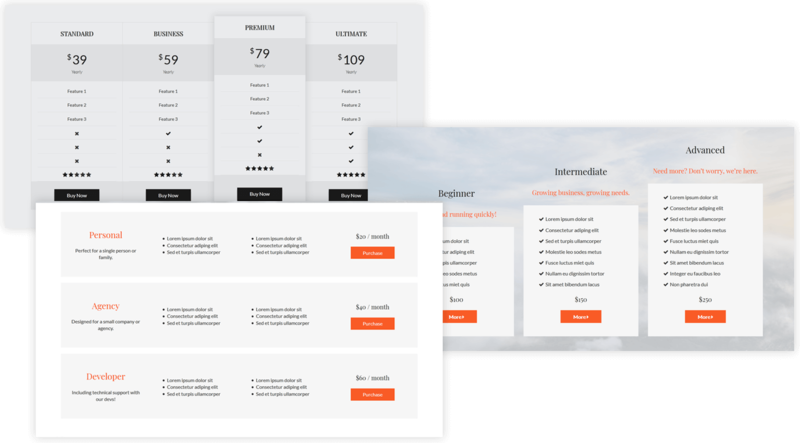 With drag and drop or advanced options, you can make the Pricing Table of your dreams. Easily show off your infrastructure with pre-designed Blocks, or create your own with our intuitive tools found in the Post and Page Builder. Add your team members with ease and customize the display with just a few clicks. Adding your Customer Feedback to your service or product offerings will help build trust with new visitors. 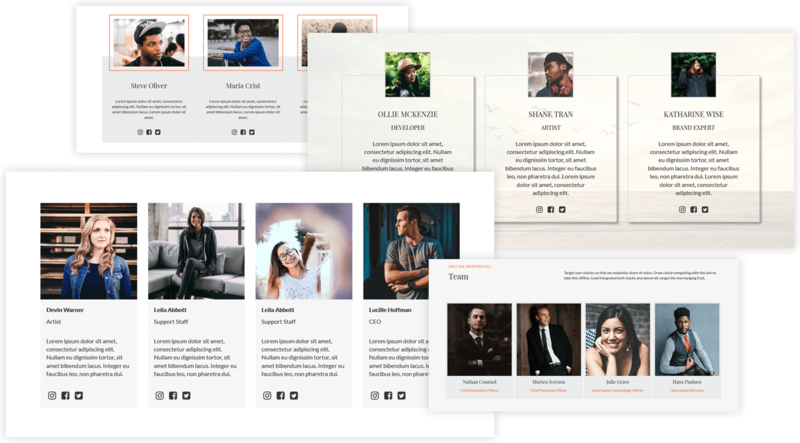 Add Testimonial Blocks and customize them using the Post and Page Builder to make your pages stand out like never before. While a picture is worth a thousand words, audio and video is worth much more to your website visitors. 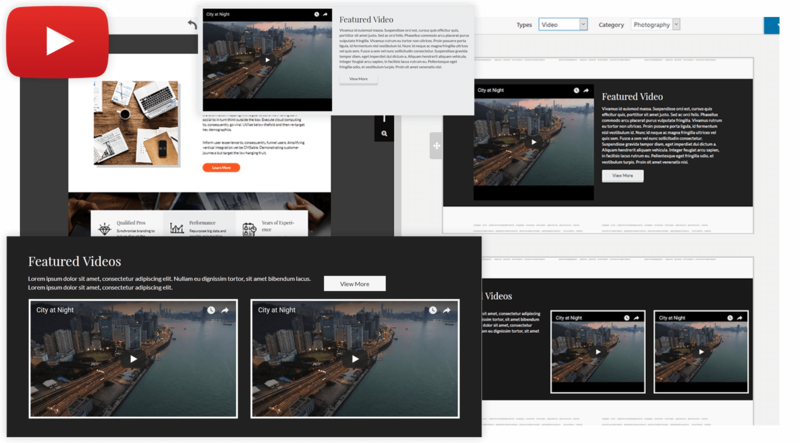 Embedding videos in your pages is easier than ever before with the Post and Page Builder. Simply copy your URL, select the video Block of your choice and insert the URL to your video. Adjust padding, margin, animation and more for every element, column, row or section you create in your designs. 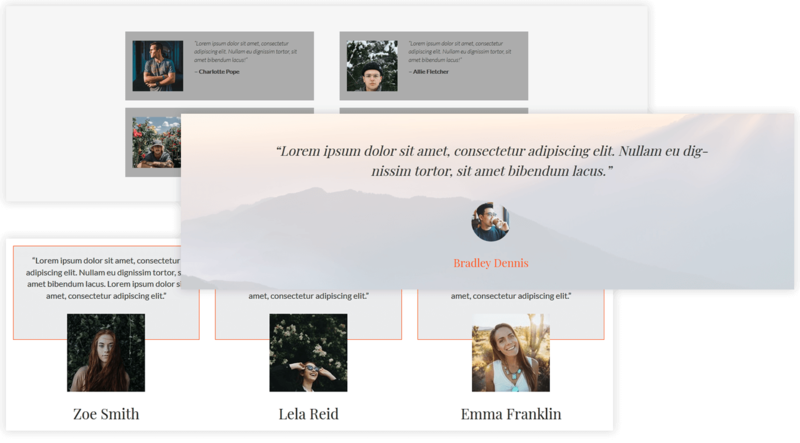 BoldGrid provides advanced options to tweak your design and content like never before! Builder provides advanced responsive controls that allows you to select the visibility of blocks, rows, and columns on different devices. This way, you can rest assured that your website is rendered perfectly on both mobile and large format devices. You can also create blocks for specific devices and ensure that they are only visible where you want them to be.